I was recently on my way back home to Dallas from visiting my alma matter in West Texas. I always put a rig together when I travel – mostly to gather ambiences, but also to capture anything else interesting I may happen upon. In this case I had a pair of schoeps CMC6 mics with the MK2 omni capsule, as well as a pair of Crown PZM 6d mics. The ride back to Dallas along I-20 runs parallel to a long stretch of rail tracks, and its common to see big freight rigs crossing the state along with us. About halfway home my wife and I spotted a train running the same direction as us, so we passed it and let it fall just out of sight of my rearview mirror before finding a place to pull over and set up. I didn’t realize how fast that train was moving though, and by the time I got the trunk open the gates were closing and the train was already on top of me. I closed the trunk, and we headed out again. We caught up to the train relatively quickly, but this time I gave us a really good buffer of time to make sure I could get set and rolling without rushing. I passed the train and kept increasing my distance for about 15 miles after passing it this second time. 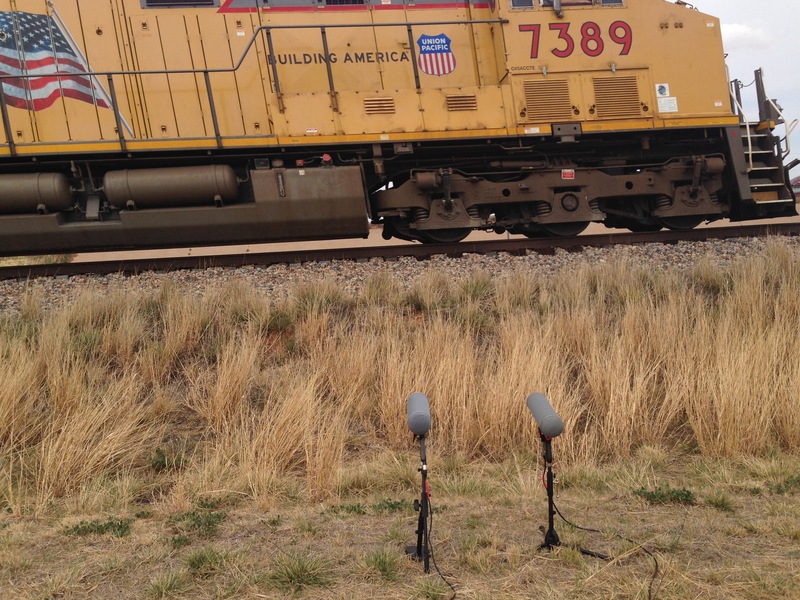 When I pulled over again, I found a spot where I could cross the tracks and set up in a way that the train would pass between my rig and the highway on which I was traveling, obscuring the sounds of other passing cars. My wife jumped out with her camera to take some rustic photos of the farm we were parked by, and my baby boy kept sleeping in the carseat while I pulled out my rig and got set up. 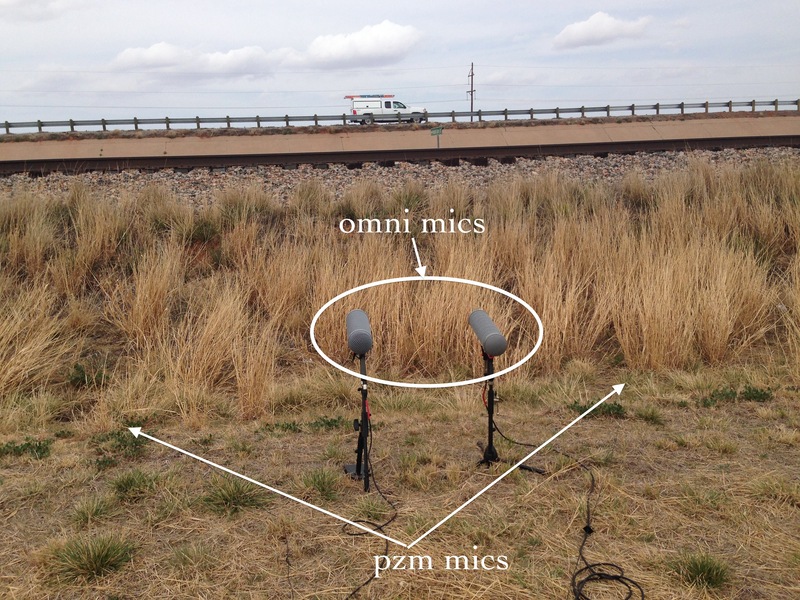 I placed the two omnis about 2 feet apart, and put the PZMs on the same general plane, but about 6 feet apart. I had concerns about the omnis being phase-coherent without a jecklyn disk at that close distance because I had run some tests earlier in the trip that didn’t go as well as I had hoped – hence the PZMs, which I knew would be good for phase. 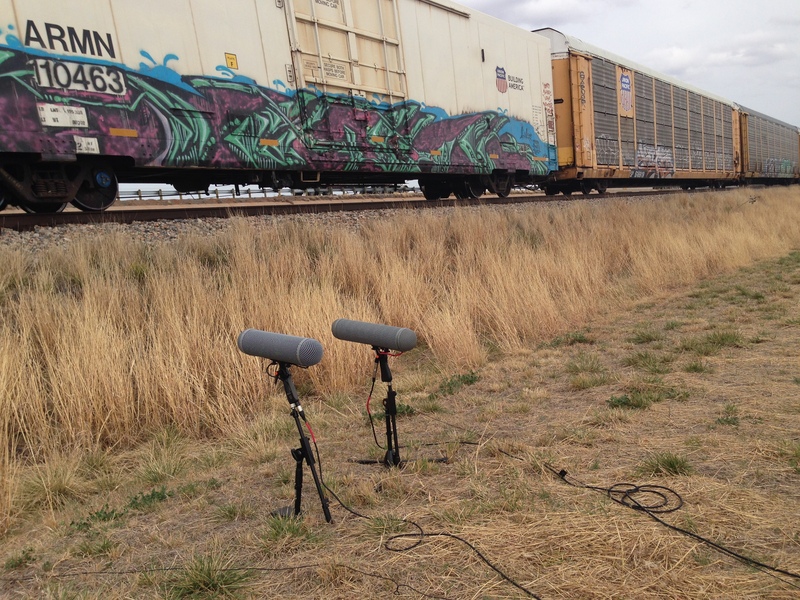 Once I was set up, rolling and slated I heard the train’s horn in the distance. Trains are required to blow their horns at each intersection they cross that doesn’t have a gate with the clanging bells, and this train was one intersection away from me. The train blew its horn one more time and then it was upon us – whooshing by with its crazy array of box cars, empty beds, tank cars, double decker cars, and open freight cars. Each car had its own sound, and it created a real variety of unique dopplers as it cruised by. Somehow the baby boy slept through all of this even though the back car door was open. Back in the studio I put the tracks up and was pleasantly surprised by how well the omnis did with regards to phase – even without a disk in-between. They captured the low end perfectly and just had a remarkably clean sound all the way up. The crowns (which I love) sounded very bite-y and midrangey in comparison, and also quite a bit “cheaper” than the schoeps omnis. No surprise given the actual price difference, but pretty eye opening regardless. I output three final files – an omni recording, a pzm recording, and a mixed recording that captured the best of both worlds. Outside of gain matching, no processing was done to these files in any way. This entry was posted on April 5, 2014 by sonicskepsi. It was filed under Field Notes and was tagged with Field Notes, Field Recording, Freight Train, texas, trains, Trains: Design.